I decided to try something new. I have no idea how it’s going to go over with all of you, but I would never find out if I didn’t try. I spend a ton of time on the internet. A TON. I am on Facebook and Pinterest several times a day. Keep in mind that it’s my job, but along the way I see a lot of cool things…useful things that I want to share with you. I know your time is precious and that trolling the internet doesn’t rank in your Top Five things to do with your spare time. That’s where I come in. My Favorite Things will consist of anything that might put a smile on your face…or make your life simpler…or even make you feel better. Some products will be affiliate links, but not all. I won’t limit myself to sharing only the things that make me a few cents. My promise to you is that I have tried, and loved, everything I recommend. So let’s go! About a year ago, I shared a post about my experience with essential oils. I initially started out with Young Living and I loved them. They are truly a trusted and good brand. The thing is that the more I used the oils, the more I wanted to use them…which also meant buying them. After a while, I really felt like I needed to try and find a comparable brand that was less expensive. I tried a few different kinds and my favorite is Rocky Mountain Oils. They are, in my opinion, amazing and I can purchase them on Amazon via my prime membership. (Which means I get them in two days with free shipping.) I’ve tried Peppermint, Lavender and Calming. If you have wanted to try essential oils but hesitated because of the price, I urge you to order one and see what you think. Oh my gosh I love this app! I found it in my Facebook news feed and the reason I clicked to see more was because the post featured a picture of Anne Hathaway as Jane Austen. I have a “feeln” you would have clicked too! It can be downloaded on literally every device out there. Smart TVs and media players plus mobile devices (iPhone, iPad and Android.) It’s not free but the price is so reasonable that anyone can enjoy it. If you sign up for a year, the cost is $1.99 per month. If you want to take it a month at a time, the cost is $3.99 per month. I signed up for just a month to see if I liked it…but I can tell you that when it comes time to renew I will be going for the whole year. I’ve already watched two movies. One was called The Magic of Ordinary Days and the other was Loving Leah. One of the reasons I’m so excited about this app is because I have a hard time unwinding in the evening. If there isn’t anything on regular TV to watch, which is a lot of the time, I tend to sit with my computer and work. That’s not good and I know it. With this app, I can either sit in my chair with my phone or I can head to bed and watch a movie there. Try it out for a month and see what you think. This is one of those little impulse buys that has turned out to be the best thing ever. I was Christmas shopping on Amazon back in December, and along the sidebar they were streaming stocking stuffer ideas. This mobile phone stand was there so I clicked over. I decided what the heck…and ordered one for each member of my family, including me. I use it literally all the time. In my kitchen, in the car, in bed when I’m watching a movie. My husband doesn’t use his so I nabbed it. Now I have one upstairs and one downstairs. Once you start using this, you won’t know how you ever got along without it! Shoes and I have a life long, love/hate relationship. Like most women, I adore pretty shoes. The problem is that I have issues with my feet so I’ve never been able to wear those pretty shoes. Occasionally though I happen to find a style of shoe that looks good and is also comfortable. While not exactly pretty, that’s what these Clarks Breeze Flip Flops are. I actually have five pairs (in different colors of course)…which may seem extreme but they are all I wear from May until October. They look cute with shorts or capris…and even casual dresses. I hope Clarks doesn’t stop making them any time soon! I remember thinking when this movie came out last year that it looked really good…but like many “smaller” films it never came to our cinemas. (Which really is not fair but that’s another whole issue.) Anyway, last week I noticed it was on my pay-per-view channel so I watched it. Oh my gosh. I liked it so much I watched it again the next day before my 48 hours was up. I’m seriously considering watching it again on my Amazon video app. It’s a gentle but beautiful love story set during the 1950’s in, of course, Brooklyn. It starts in Ireland, and then moves to Brooklyn…and back to Ireland again. It’s also a book, which I have not read, but I’m told is very well written. It’s one of those movies that makes you feel good…and we can all use a little of that. If you don’t get pay-per-view, it’s also available right now in a Redbox near you. CentimeGift is a shop on Etsy that makes custom engraved jewelry items. When my mom passed away, my daughter took it pretty hard. 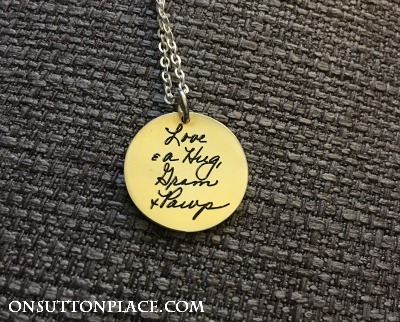 She found this seller on Etsy and had a necklace made with my mom’s handwriting. I think Elizabeth just needed something to hold on to…so she had a little disc made with my mom’s handwriting and a bar with my dad’s. The disc is pictured above. So…if you have lost a loved one, and have a piece of their handwriting on a card or letter, you can have something made too. These would also make really lovely gifts for happy occasions. Bridesmaids gifts, anniversary gifts or even something like First Communion. There is still time to have something made for Mother’s Day so if you like this idea, don’t wait. Just do it. Well, that wraps up the first edition of My Favorite Things. I’ll see how it goes and if you all like it, I’ll do it every once in a while. Not too often, I promise. I’ll be back on Thursday with my front porch…see you then! additional cost to you, by advertising and linking to Amazon.com. I love this idea! You’ve already inspired me to watch the three moves and to check out Feeln. Looking forward to your next favorite things post. Ann, I think one thing you missed was your love of Williams Sonoma.. or was it Sur La Table. I remember you stating that you liked getting gifts from there. I love these favorite things. I hope you continue posting “My favorite things” occasionally. I think we have similar tastes so I’m interested in products you’ve tried and found worth your time and money. I love your “favorite things” post. Must comment on the movie Brooklyn first. It was so much better than I expected. The surprising thing is my husband really got involved with the story and we talked about it a few times over the following days. Looking forward to more of your favorite things as you seem such a common sense girl! I just watched Brooklyn. Completely wonderful. I want to know about more movies that are gentle, without the loud, fights and violence punctuating the movie throughout. This was so refreshing. More posts like this please! Loved it thanks. You spent the time and tried now I don’t have too. I think this post was a great idea, Its always great to hear what other people think of products that you may want to use but have not because you were just not sure about them. Thank you so much for the link to the Etsy shop. My dear father passed away six years ago and I’m sure I have a note or card from him somewhere. I would love to have something made for myself and my siblings. Love your posts even though I don’t always respond! HI Ann, love your favorite things and am looking forward to more. Just bought. Thank you so much. Just picked up a pair of the pink Clarks! Love them. I will look for Brooklyn and the oils. Love your gardening and cooking tips! Thanks Ann! These are great suggestions, will definitely try Feeln. I like to stay up late at night but there is rarely anything on TV that I want to watch. Audible has great audio books, but it would be nice to watch movies for a change. Looks like Feeln has a great selection. Well Ann as usual you have out done yourself. I’m so glad you listed some of your favorite things and we’re to purchase them. A wonderful list that I will definitely try some of the products. Thanks. Good information, Anne. I love seeing what other people are using that makes life a little easier, convenient or fun. I’m actually planning to do something similar. I just need to get the ball rolling. I loved seeing your favorite things. Perhaps this could be a once a month share. I’m going to try out the sandals since I also wear them for months. ♥♥♥ this post and I just ordered the Clarks, I have about 5 pairs of REEF flip flops so I am willing to try another brand that is comfy and cost less too. All great recommendations! Thank you!! for me to wear and I feel stylish, also enjoying the colors. Love the locket. Thanks for sharing. I no longer drive, have wonderful support but enjoyed perusing Issue 1 w/o holding anyone up. Loved ‘Brooklyn’! What a great movie. Thanks for the recommendation. RMO is a terrific EO company. I used them until I developed an allergy to EOs. Ann – I loved this post and I would love it if you do one on a regular basis. I have been wanting to try essential oils and this would be a great way to try them. I’m also going to check out the movie app I love that movie loving Lea – we get the hallmark channel and I taped it when I need a pick me up I watch over and over again. I’m almost done with my first wreath and I will email you a photo when I figure out the ribbon. You’ve inspired me and I finally bought the necessary items. I rarely comment but this is great. Please continue, really liked learning about all,these things. A special shout out for any suggestions of comfortable shoes! Oh my gosh! We are so alike! If I find something that is really comfortable, I will get one in every color! I would love to see more posts like this. Last year you mentioned some yoga pants that you found at Walmart. Well, I got a pair and I have just about worn them out!!! (But not doing yoga, that’s for sure!) And on a side note, I got a sewing machine! I like your Favorite Things. I saw Brooklyn when it first came out, loved it so much I read the book immediately, and nagged my daughter daily to watch it when the dvd came out. A bonus for me is that I have spent my whole live explaining my name (Eilis) to people and now I share it with the main character! I love the personalized charm idea and am Pinning it to my gift ideas board. Thanks! Ok you win! I only have three pairs of those Clark’s flip flops! Navy, tan and coral. A wonderful feature – please consider making it a permanent one! Checking out the essential oils…thanks! I do love your “My Favorite Things”! It’s great to find out about unique items out there from someone! When my kids were younger I loved Family Fun magazine’s Favorites for products, toys, etc related to kids. I think I’ll make a Pintrest board to help me remember unique items out there. I really like the handwritten necklace idea for gifts! Thank you also for your blog! I really enjoy it because it feels like you’re stopping in for a visit! Ann, I love that you are posting favorite things. There is another blog that I read, and I read it primarily for the favorite things articles. I’ve found so many nice things to buy for gifts! Wasn’t ‘The Magic of Ordinary Days’ wonderful?! It’s one of my all time favorite movies. I’m looking forward to watching ‘Brooklyn’. I’m sure it’ll be just as good. Keep up the good work with your blog. I read so few any more, but I will never stop checking yours out. I really enjoyed this – I’m looking forward to the next one already! Hi Lori! I use the peppermint oil to ease headaches…and it actually helps prevent them if you use it every day. I apply it over my ears and on my temples every night at bedtime. I wear glasses and sometimes that spot over my ears just throbs. The peppermint takes it away instantly. I also put a drop on my tongue if I have an upset stomach. It always helps. Try it! I am so happy you shared the handwritten sentiment site…I may need some mother love!! Really loved this. It was like having a personal assistant to help me narrow things down online. Thanks so much! Thanks, Ann. I always enjoy seeing what others “like”. Since we all have limited time, and there is so much out there to see, it’s always welcome when someone gives you a heads up on a favorite book, cosmetic, movie or whatever. I also loved Brooklyn the movie…very beautifully done! Please keep your favorite things coming! I LOVE these ideas! Thank you so much for sharing some of your favorites. Personal recommendations are always the best. BTW, you’ve been in my prayers since you lost your Mom. Love this idea! Looking forward to more!! Cute! Your site is so fun & upbeat. I loved & passed on your quick chicken & noodles recipe. How do you use your essential oils? I sometimes sprinkle them over my sheets right b/4 bedtime if I’m feeling particularly restless. Tried them in the tub but that led to a health issue. I too spend hours on the internet, especially decor sites. I justify my excess by thinking how it keeps my computer skills up, challenges my mind, entertains me, etc., etc. I had to go cold turkey on the bedtime viewing as I would get so carried away, I’d stay up all night. Now I watch the things I have taped on TV and my sleeping has greatly improved. I would love it if you continued this kind of post. I found several things on this one post that I am interested in checking out! I vote yes! Love your blog and I really enjoyed “favorite things.” I plan on checking out some of the items you mention. I read the book “Brooklyn” and I loved it. Keep up the great work! I love your blog, and I love this new idea! Thanks for sharing such delightful finds, and I hope you continue doing so! I love this new feature! Please post your favorites as often as you like. I plan to check out a few of these items. I enjoyed your list, I’d like to see you keep doing it. Great stuff, I loved reading this! Keep it up! This is the only blog I regularly visit! I get so tickled to get your emails. Keep up the great work! Love this post Ann! Fun to see what other people live and find useful???????? I like the idea of your favorite things. What are your favorite sites on pinterest and the internet. Who are your favorite bloggers? After you. I am eager to really read and investigate your favorite things. Your tastes are often mine. Thanks and congrats on the good idea. I love your blog; it’s one of the few that I always read because it always provides value, and really like your new section “My Favorite Things”! It reminds me of my all time favorite movie, “The Sound of Music” . . . “when the dog bites, the bee stings, I simple remember my favorite things”! Perhaps that’s where your inspiration came from. Anyway, I think it’s a “good thing” and appreciate that you recommend only things you’ve tried. As a side note, I think I’d put your blog as one of “My Favorite Things”! Thank you for all those recommendations ! I really enjoyed all of them, and plan on trying out a few, such as the sandals ( I have foot issues also ) and the essential oil and the entertainment items. I hope you continue to have these type of posts. I love to try things out that have been tried by someone such as yourself ! I enjoyed checking out your favorite things. I also love Clarks flip flops! They are so comfortable! Love the personalized gift so much! And the recommendations for watching movies. It’s so hard to find good ones. Thank you Ann! I enjoyed reading about your favs and will check them out! Also I love your printables as well. I have printed and shared several of them! Thank you for your generousity! I checked each and every thing out except the flip flops. I love when someone picks their favorite things from things they have or actually used! Looking forward to the next Issue. Thank you from Lexington, OH. Really enjoyed your “Favorite Things” .The personal experiences/comments are so valuable. Please keep it going. Thanks. Thanks for sharing your fav things Ann! I’d enjoy seeing this once a week, so many good things out there and you can’t catch them all. I’m all for quick and easy online shopping these days. Don’t have the time or the energy to go to a lot of stores anymore! I like Clarks for comfort too. Have you tried Ecco shoes? I can walk all day in their sandals. I enjoyed that. My mailbox is always so full, so I’d only want it once a week. Hope to view the Brooklyn movie and maybe even read the book. Thanks. Oh I wouldn’t do it once a week…I was thinking every month or two. No worries! I really enjoyed your faves list. Give it to us often. It’s nice to get a few pointers on products out there we might not have known about. I LOVE this list of favorite things! I am going to order a couple of them today to try out! Thanks for sharing your hours of research! Can hardly wait until Favorite Things, Vol 2. Meanwhile, I will be following up on several of these. Ann, love your favorite fives. Saw Brooklyn, since I had traveled Ireland, and enjoyed this movie. Clarks have been my fav, wore them when I taught, and now as a retiree. Definitely using etsy shop to order several gifts with my mother’s handwriting. Keep sharing, please. Yes, I like to read about others’ favorite things and why they are their faves. Definitely going to try the peppermint oil. Love peppermint. Looking forward to the next “favorite things”. I love your favorite things – they will easily become my “favorite things”!! Especially love the Clark’s and the essential oils!! My vote ~~~~ Keep this idea (or ideas!) going!! Ann, I love this idea! I feel like we would be great friends, because we appreciate the same things and I love your style! I am a wedding florist/designer, and have no time or patience for internet searches or keeping up with what’s new out there. Thank you for doing it for me!! I’ve wondered about all these products and love hearing your opinions on them. Keep it up, you’re improving my life! I enjoy so much reading your blog and love this new addition! Your style fits mine perfectly and I love getting inspiration from you for my home. I was very sorry to hear about your mother and truly hope that the arrival of spring and your memories of her will help you! I really enjoyed your blog today. Actually, I enjoy all of them. I always read each one. I especially like the fact that you never “brag” about your ideas like many others do. Just wanted to say thank you and hope each day is getting a little better for you since your Mom’s passing…. Really enjoyed your favorite things! Thank you for sharing that with us! I love your blog. ???? I loved your favorite things post. These kinds of posts always give me great ideas, sometimes a little out of my box, without taking too much of a risk! Thanks for sharing your favorite things. P.S. Try Vionic Flip Flops, they are great for troublesome feet and they have cute styles too! This is a great brand. Bought six pairs last summer. I love Vionic flip flops. Well worth the money! I loved your blog and can’t wait to try some of the items you listed. Yours is one blog I take the time to read all the way through! Really liked this post. Those do look like comfy flip flops, where do you buy them?? Also that movie sounds good too. Will look for it the next time we are in a movie mood. That is also a very neat idea about the handwriting keepsake. Well, have a great day and hope you are doing well. Love your blog Ann. I have “many” foot problems as well and used to love wearing high heels, but can’t wear them anymore as well as a slew of other “pretty” shoes. I’m in Canada and we do have Clarks shoes. I like the look of those sandals and will have to see if they are available here. I also watched Brooklyn and loved it as well. Another film that is out is The Lady in the Van with Maggie Smith, which I think will quite good as well. I love this new idea, Ann! It helps to know when someone has tried something and can recommend it, and so I look forward to the next time you share My Favorite Things. In the meantime, I will check out the ones you shared today! I am on Facebook and Pinterest many times a day even though it isn’t my job. I’m just addicted. I love all these things and thank you for sharing. When I’m on Pinterest I always recognize your pictures and “like” them. Love your style. I ordered the Clark’s shoes. Hope they are as nice as they look. Thanks for the recommendations. I really enjoyed reading your 1st Issue – the mobile phone stand , flip flops and engraved memory coin are keepers for “I want that” list. Looking forward to your next issue! Loved your new section. Hope it stays. I like it. . . . .it’s like you’re doing the “col” shopping for me! Thanks! Ann, I love the gentleness of your blog. It is authentic-which can be hard to find in the blogging world. Please continue with your “Favorites Things”-love it. It is like you said you spend a lot of time on-line and you see so much more than most of us. I appreciate being able browse with short cuts and your recommendation are exactly that. PS did the phone holder work with the case being left on the phone? Yes it works with mine. I have a hard case I purchased at my Verizon store. I’m not sure it would work with the cases that are sort of soft and less rigid. The suction cups work on a spring so it really does grip the case well. Can’t tell you how much I love your blog. It feels like you are sitting right here talking to me. I love it that you’re not “over the top” with your decorating, cooking or DIY’s and are sensible with your spending. Please keep sharing your “finds”. I love that disc necklace idea for my daughter as well. All good things! Thanks Ann! I really enjoyed reading your favorite things. So nice to get an honest opinion from someone I trust. Keep up the great work! Love this twist. It’s interesting and feels fresh because we don’t have any way of foreseeing what will be shared. Peaks my curiosity! This is a wonderful thing to do. I thoroughly enjoy it. I love the idea of using the persons handwriting on a disc for remembrance. Beautiful. I have not watched Brooklyn yet, but I need too. Age of Adaline is a good movie I recommend. Thank you Kathleen! I saw that movie on my pay per view and I wondered. I will definitely watch it now. Hope things are well in AZ! I like this new “series”. It was very informative and helpful. I hope you decide to continue having it. Thanks so much! Thank you for this, Ann. What a great idea. I look forward to more finds! I enjoyed seeing your finds. I am a big fan of Clarks shoes. They are all I wear. Last fall I finally convinced my husband to buy a pair. Now he’s a fan, too. Coincidentally, a friend posted a picture of a similar handwriting gift on Facebook. I would love to find an example of my mom’s that I can use. What a great way to start my day. I broke my ankle and have been surfing the Internet a lot. I have some new places to go. Thanks. I enjoyed your Favorite Things. You’re right – there is so much good stuff out there and I appreciate your pre-screening of products and sites. I am happy for your reviews. Love the personalized keepsake info! Yes, Yes keep it up !!! Keep going! Love this! Honestly, I typically skim your blog, mainly to look at the beautiful pictures, or get the general idea of a project or recipe, but this is the first time I have literally read every word. I love all of your thoughts behind each product! Thank you for sharing! Oh my gosh Sarah thank you so much for telling me this. You absolutely made my day…and thank you for following along! Love the idea! Keep it going. I LOVE this idea and have already ordered 3 engraved necklaces this morning. They were an item I have thought about for some time and am happy to know of someone who has received this item and was please. Great idea and I look forward to your next post. I like it. It’s good for those of us that don’t get to see latest in fashion and home gadgets. Great idea! Good luck with it???? Thank you Anne. Great idea! Thank you for sharing , enjoyed seeing the thoughts behind them all ,a very personal touch and I look forward to seeing more of them . I really enjoy your blog and creative ideas. Yes! I like “favorite things” posts. I hope you continue this on a regular basis. Thanks! Anne I love this!!! Why reinvent the wheel? When someone trusted finds great products and saves me time hunting for them – what’s not to love???! I’ve already gleaned from some if your favourites in past posts … Like waterlogue and the Craftberry Bush site and her amazing pillows! If you like Clarks, try Vionic shoes as well…..fabulous for your feet. I can’t wear alot of sandals …way too flat, but Vionics sandals have the best arch support I’ve ever found. Thank you for sharing your favorite things….a wonderful idea for your blog! I always appreciate getting suggestions/ideas from others. I look forward to Issue 2. Keep up your “My Favorite Things”….love it!!!!! My daughter uses essential oils and makes many of her own concoctions…..a really nice cream for her baby, using lavendar oil and coconut oil. Jordyn gets daily baby massages and has the best skin. Even the pediatrician commented how wonderful the babies skin felt (I know, baby’s skin is nice anyway, but this makes it even better.) Also, my daughter is susceptible to migraines and uses peppermint oil to ward off the dreaded headache! It really helps when she dabs it on her temples. Enjoying your posts…..always look forward to what you’ve written next. Enjoyed it and looking into the RMO’s. Thanks Ann. It’s nice to have you browsing for me. I trust your taste and appreciate the suggestions. Most of all, I just like touching base with YOU. Great choices, Ann! I love my Clarks flip-flops, too. Ann I love Favorite Things!!! I started using Essential Oils too! I love Serenity! I’m going to check out those Clarks flips! Thanks for the post, keep your favs coming! Oh my gosh – My daughter is in from California and we watched the movie Brooklyn – we loved it. This is a great idea you have. You are so right when you are saying we all do not have the time to search the web and looking at the things you have chose – I think this will be a wonderful addition to your blog. I LOVE this post! My son has one of those mobile phone stands and uses it ALL the time! For the most part, he uses it in the car so he can be hands free but also likes to use it in the office. I gotta get one for sure! Now I personally don’t have any of those Clark shoes, but my mother does and she swears by them too! The Centime Gift!!! OMGosh…I so want one of those. What a truly wonderful idea! I need to have one of those made with Audrey’s handwriting for my mother:) And Mother’s Day is right around the corner! Thanks, Ann:) This was a great idea! I love this idea! And I like your chosen favorites. Thank you for thinking of us. Have a lovely day! ???? LOVE IT ANN – VERY HELPFUL – DEFINITELY DO IT AGAIN!! Thanks Ann for sharing your favorite things. I always like to hear what others have found and enjoyed on the internet. I, too, have been a Clark’s free flip flop girl. We share similar interests. I’m going to check some of these out for myself. I watched Brooklyn this weekend – 3 times! I always get great idea s from you! I think this is a great idea!! I’m going to try at least two of the things you have suggested. Thank you so much. Thank you so much! I’m a busy gal (like everyone else!) with a full time job and a greenhouse in full swing, I don’t have time to shop, so seeing what you have found and enjoy is wonderful! Please continue to include us in your great finds! I am definitely going to take a look at the etsy shop. I also loved Brooklyn, I recommend you read the book! I actually stumbled on it on pinterest under books you should read before they become movies. Sometimes the book is better, in this case I liked the movie more because the mail character is more sympathetic in the movie but the book gives much more detail about the life in Ireland. Love your post!! I have purchased many “favourite things” for either myself or as a present (like you did with the stocking stuffers). I have never been disappointed! Thank you for sharing – it’s like a friend recommending new products and why not?! Have you are having a good day and the sun is shining, Ann!